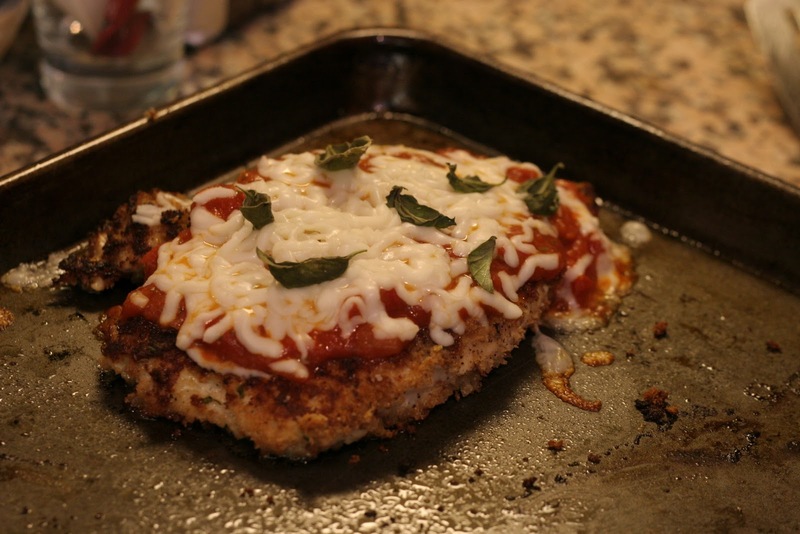 Chicken Parmigiana is something my dad would make for me when I was a kid, and the combination of crispy fried chicken cutlets, tangy marinara and oozing cheese makes it a favorite comfort food. I hardly ever deep fry (or even shallow fry, actually) at home, mostly because it’s too much trouble on a weeknight and also because I do have a fear of doing it incorrectly and ending up with loads of oil soaked into my food. I’ve found a way to get a nice, crisp breaded chicken without deep frying, so I thought I’d share my recipe with you. PS: This breaded chicken on its own, sans sauce and cheese, makes a great main dish too- just serve it atop a mixed green salad! 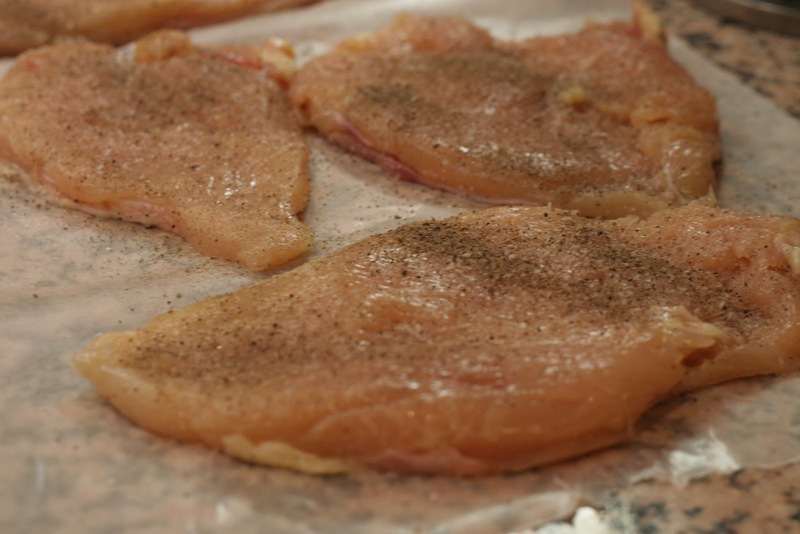 Put each chicken breast in a large Ziploc bag; pound each breast until they are about ½ inch thick. Liberally season each side with salt and pepper, set aside. Make the coating with whole grain bread: I use whatever I have in the freezer- the ends of various loaves of whole grain or wheat bread. Just toast them lightly, then whiz them in your food processor along with salt and pepper and the parsley. Once it’s processed, add the parmesan cheese just to mix, then pour bread crumb mixture into a dish. Whisk the eggs in a baking dish and set up your dredging station: Chicken, egg, breadcrumb, baking rack. 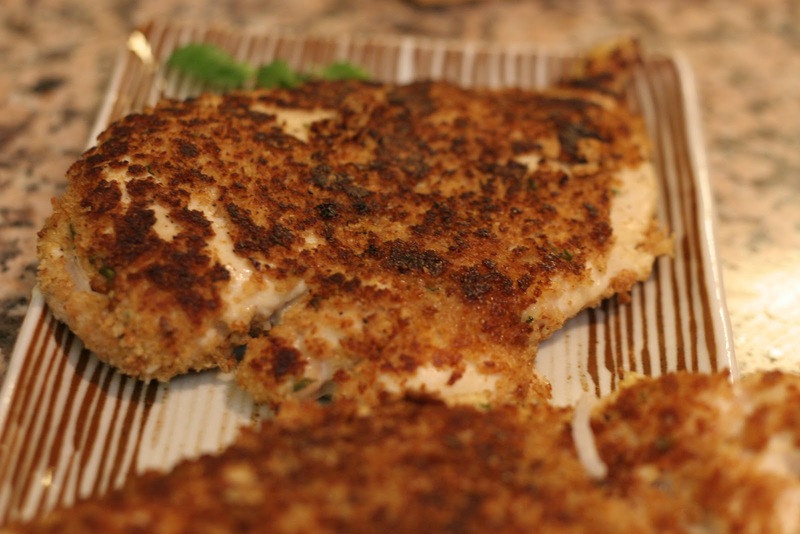 Take each breast, coat it well in the egg, then dredge in the bread crumbs, pressing down on each side so it gets a nice, even coating. 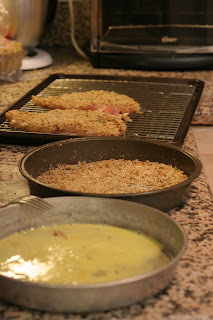 Set on the baking rack repeat with the two remaining chicken breasts. Heat up a large sauté pan with cooking spray; cook chicken breast about 3-4 minutes on each side until golden brown. Lightly coat a baking sheet with cooking spray and put the chicken breasts on it; top each chicken breast with ½ cup of marinara sauce and ¼ cup mozzarella and put into the oven for about 3-4 minutes until the cheese is melted. 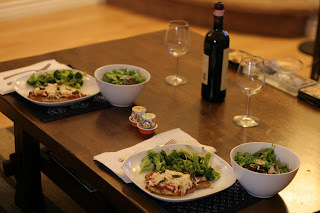 Serve with pasta (save a little sauce for that) or sauteed broccoli, a green salad and some red wine, like I did! ﻿Leftovers make great sandwiches too. Enjoy! 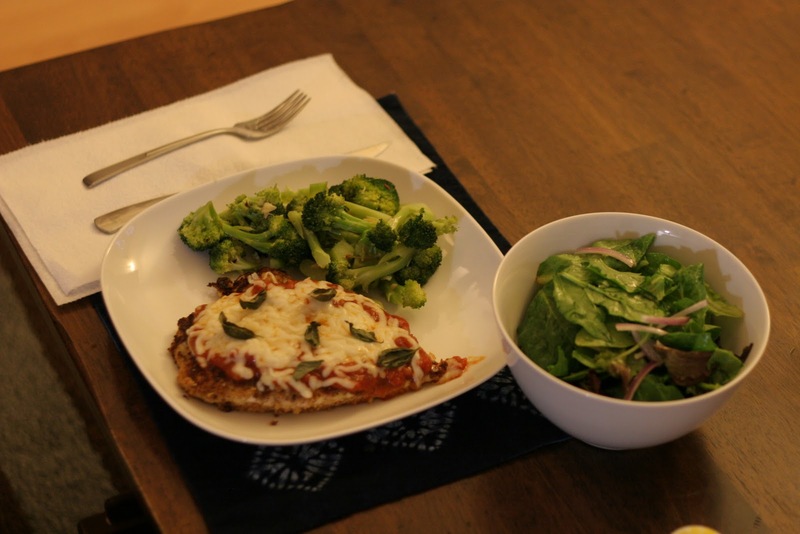 I love doing the same thing - making traditionally heavy dishes healthier with small tweaks! I actually find that I usually prefer the lighter version -- certainly makes me feel better afterwards too! I've currently been obsessing over the idea of using silken tofu in replace of ricottta in lasagna. I might be going a little crazy with that thought, but I may just have to try it! Diana: That is so funny- I used silken tofu ALL the time in exactly the way you described! I put a heavy duty paper towel (cheesecloth works too) in a colander, mash the tofu up and put it in, put a bowl under it and let it drain in the fridge overnight. You won't get a ton of liquid but you'll definitely get enough out. The next key step is to really flavor it well since it has virtually no flavor on it's own. 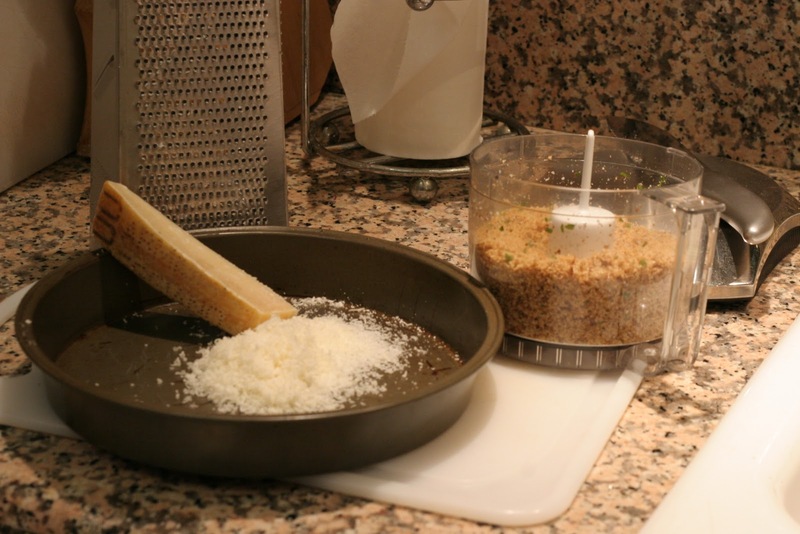 I sautee minced onion, garlic, salt, pepper in a pan, then add it to the drained tofu and whiz it in a food processor. Add some basil if you like, and a small amount (maybe 2-3 TBS) of GOOD grated parmesan. Whiz again. You could add boiled, drained and squeezed-out spinach too if you like. I'll usually add some cooked, crumbled turkey Italian sausage to this mixture, then layer it between pasta sheets and marinara. I'll add one layer of grated mozz at the top and bake. Honestly, I think it tastes great. Thank you so much! I'm definitely going to be trying this soon. My friend made this amazing pumpkin lasagna a few weeks back and I remember watching her layer on the filling thinking, "I wonder how that would be with tofu instead of ricotta..."
This looks great, fits with my diet and falls under the very small window of meals I can actually make, since my cooking skills are what professionals in the food industry refer to as "awful." Looking forward to trying this, thanks! I am soooo going to make this very soon!